Her mother objected when Loretta Swit decided to go into acting, and Swit objected when well-meaning agents suggested she get a nose job and a more "normal" last name. She was 30 before acting paid the rent, and 35 before M*A*S*H debuted, with Swit as Margaret "Hot Lips" Houlihan, the hard-edged American nurse in the Korean war. 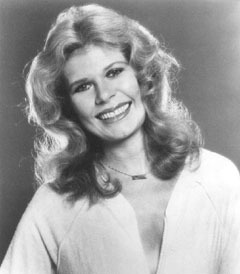 While the television series remains by far her best-known work, it may have also kept her from greater fame: Swit starred as Christine Cagney in the telefilm of Cagney & Lacey with Tyne Daly, but when the network decided to make it a series the producers of M*A*S*H would not allow Swit out of her contract. The part of Cagney was recast, first with Meg Foster, then with Sharon Gless, while Swit continued playing the background blonde on M*A*S*H.
Among her non-M*A*S*H roles, Swit played the housewife in charge of The Best Christmas Pageant Ever, the obnoxious gossip columnist in Blake Edwards's S.O.B. with Julie Andrews, the American President who led the nation into World War III in Whoops Apocalypse, and she was chased by Satan-worshippers in Race with the Devil with Peter Fonda. An earnest animal rights activist, Swit testified before Congress in 1999, pleading for the prohibition of so-called "crush videos" -- fetish films wherein insects, snails, worms, or occasionally small animals like guinea pigs or frogs are crushed on camera, usually by women wearing spiked high heels. Such films are now illegal in America, and possession of videos like Charlie's Ankles or Squish Playhouse could cost you a prison term.